I am the father of two amazing boys that keep me young at heart. I have been married for over 15 years to my college sweat heart. Currently, I work as a counselor for at risk youth, but have worked in education, ministry and the business world. Tell me about your blog, the name, what does it mean to you? My personal blog is http://www.waystationone.com Funny, waystationone was the name of a cafe/coffeehouse I once wanted to open. A waystation is a place to stop along the journey, and one, i guess i wanted to be the first stop. smiles. we are all on this journey through life and need to take time to appreciate it...so that is where it came from. When have you started blogging? I started blogging in October of 2007 at the request of a friend. I really did not want to start a blog but he really encouraged me (twisted my arm) and so I started. The first six months I was figuring it out, barely had any readers, but if you look at what i was posting that makes sense. Yes, I do. After the first six months I started experimenting with story telling and mostly wrote prose for a year until a commenter (Kat Mortgenson AKA Poetikat) challenged me to write poetry. She thought my style of prose translated well and so i wrote my first poem. pulling me further into itself. I want not to care. Life mainly. Most of my poems come from something I have experienced. There is so much poetry just waiting to be found. Everything has a story. There is a poem in everything. As far as style, I have never really had any training when it comes to poetry. I knid make it up as I go along. I was writing poetry for about 9 months before I started reading poets, outside of the blog world. About a year ago, I started getting into slam poetry and really studying how people construct poems artistically and how words sound when spoken. That made a huge difference in the way I write. When did you start writing poetry? Do you write fiction as well? I would say my strength is in the descriptions and details that I include. My goal is to put the reader in the scene. I have many. Stephen King. Shaun Tan. Nami Mun. Jodi Picoult. For fiction. For poetry: Langston Hughes. Saul Williams. Taylor Mali. Bukowski. What's your plan for your future writing? hopefully i get to keep writing. i love writing. i have been published a few times now and have a poetry book coming out soon with many of the people I worked with at One Stop Poetry. As I said earlier, we recently opened dVerse Poets Pub and have had a tremendous response. For me this is a way to give back and encourage other poets. If someone wants to write, I want to see them excel at it, I want to water that seed. That is what dVerse is all about. So, I want to see that continue to grow and see more lives touched. Any advice to poets who wish to start their own poetry community or blogging community? It is a lot of work. Know that up front. If you want to really build a community it means investing in others. Build a team, you can not do it all yourself. Make sure you know who you are working with, don’t just pick the best poets you know, find ones that have talents beyond writing and will get their stuff done on time or early. Look for creative thinkers and listen to them. Let them own a piece of it so they can play and create themselves. And check your motives, because it is not about you. Beginning Thursday, Jingle Poetry has moved to The Gooseberry Garden, everyone is welcome! Sculpture from the famous Sun Temple "Konark"
Welcome to Jingle Poetry Potluck Week 48, and I must thank you all for such a lovely response we got with your posts. It was nice to be there and read all your lovely posts and enjoy the talent of the diverse group of people this online community attracts. So here I am again SHASHI going on to my 6th week of Poetry Potluck. Jingle Poetry will move to a New Location, Beginning August 18, 2011.. Welcome to The Gooseberry Garden! To inspire you, here is one of the most beautiful Verse by Pablo Neruda ‘Body of a woman’. This verse, as one of the writer said, is an introductory text to the poetry of desire. Gabriel Garcia Marquez said of Pablo Neruda," The greatest poet of 20th century - in any language" and here is one of his interesting and beautiful verse called "Body of a Woman". Jingle Poetry will to a New Location, Beginning August 18, 2011..Welcome to The gooseberry Garden! Jingle Poetry has been a remarkable experience to Jingle, in the past 11 months, we have more than 1,200 poets come and go, still, 30% of our supporters have remained in the community and remained active. The enthusiasm, the quick words of encouragements, and the lasting trust and/or selfless contributions are exceptional, besides officials who post and support, these poets are shining stars who brighten Jingle Poetry Community on weekly basis and they are essential part of our blogging body. Today, I picked the most recent active and supportive participants to represent here, please read their thoughts, visit their blogs, and get ready for our 48 poetry potluck tonight. When I desperately needed to do something because I might go crazy if I stay as is and if I can’t think of anything but how hurt I was. That was one year and one month ago – July 2010. I never considered what I had written as poems. I just wrote them because I can’t write anything long so, it’s more of a matter of efficiency on my side – I guess an instinct of someone who studied Industrial Engineering where systems efficiency is an integral part. Needless to say, I was surprised when I was invited to join poetry challenge. Rarely to back out from a clean challenge, I joined for fun! What’s the benefits for being part of Jingle Poetry Community (Including Thursday Poets Rally)? Benefits? None at all! None because I call them JINGLE! How have you come to the name of your blog? While my kiddos and I are bending spoons for fun, it struck me that I am very much like a bent spoon – useless to some, fun-to-have to some, special to One. And so bended spoon was born, grammatically wrong – to warn the readers that the person behind is flawed. Thus, whoever sincerely appreciates what I share in that simple place is a true blessing. Any advice on poets who blog? I am the one who needs advice from the poets! But for anyone who blogs my advice is --- BLOG! B-ring it on; bring it out! L-ove what you write! At least one person loves it. O-h no, don’t just love yours but love others as well! I really started to blog in February of this year. I opened my Blog at the end of December, but had only used it 3 times until February, when I got a computer. It just feels right. It just flows right out, where with everything else I have to work at it. The greatest benefit is it is a great community of poets who all pour their hearts out and really communicate with each other. Both the Rally and Potluck really help each poet read, learn, and inspire others. Also when you win an award It just makes you feel so good!. hopefully show others beauty of all kinds, hopes, and the dreams of life. Take the time to read other poets work. and let them know you read it. it really means a lot. Where Pleasant Fountains Lie was opened in the beginning of June for the sole purpose of having a place to share my poetry. I've always called myself a poet, and it was time to prove it. Poets see the world differently, with an urge to collect and record. We're artists, and historians. I joined the Jingle Poetry Community in hopes to receive critique on how to become a better writer. A poet should be aware of how their work is perceived, received, and understood. My blog is named from a line in Shakespeare's Venus and Adonis. It's a sonnet about passion, sensuality, unrequited love, and loss. Always be an honest poet - share your vision, and express how you feel. There is no ugly poetry. I started blogging about two months ago, after deciding that I had time to spare and I wanted somewhere to share my writing and express myself. I tried to start a blog several years ago but I never had the confidence to keep it going. I was a bit sceptical about starting this one, but I am glad I did. I love poetry and have done all my life. When I was about four years old, my grandfather would recite Robert Burns to me and I gradually learned most of Burns’ well known poems. Since then I have been writing poems. I never kept copies of my poetry, I would give them away to family or friends and very few original poems of mine are around. Since moving to our small village a few years ago, I have been asked to write a poem for our annual Burns Supper and since then I made the decision to keep a record of my poetry. Being part of the Jingle Poetry Community and The Thursday Poets Rally is a wonderful experience. I am learning about poetry all the time. I am kind of stuck in a time warp with my poetry style and it is such a pleasure to read all the different styles of poetry that are out there. I never realised that there were so many different styles of poetry. Being a part of this poetry world is truly beneficial, I have met some wonderful people who are very supportive and give lots of encouragement. My confidence has grown since I have joined the Jingle Poetry Community and who knows, I may be tempted to try some new styles in the future. I am so glad that I accepted the invitation to join, I love every minute of it. I named my blog Jeanie McBain – All Kinds of Everything, because I intended to write about anything that came to mind, stories, poems, thoughts and other musings that pop into my head. I wanted my blog to be casual, welcoming and friendly and I try to keep it as happy a place as I can. My profile picture, hopefully, will make people smile, I made it myself using Paint Shop Pro many years ago. I hope that I have achieved what I set out to do and that people will continue to visit and feel welcome there. Blogging is an excellent way to share your poetry and have it published for the world to see. Anyone who is considering blogging their poetry should give it a try and of course it is a great idea to join a Poetry Community like Jingle to enjoy the world of poetry blogging at its best. The poetry was just a natural progression. I like to tell stories, but, I also like to entertain and... sort of condense a long story into selected and hopefully, beautiful words. Poetry is a challenge, and that's why I think I do it. The Jingle community is a lot of fun. I love that everyone is welcome, from the experts and published, to the week-end poet who just has something he/she needs to say. I love the emotion and honesty in their work. I especially like the encouragement from not only the poets, but from the officials who work damn hard to read everyone's write and to make them feel like a part of a wonderful group. I also like the awards. LOL. I do. Pondering life is what I do. I hope I never stop wondering about everything. I hope to never become jaded or bored, so, I ponder. I chose the name, Thingy, from a book that I loved and still do. Long story, so I won't bore you, but it fits me. The only advice I have is, try not to be someone else. It's great to experiment, but, like writing, write what you know and write for yourself. That is the most important thing, I think. I started blogging in 2007 but I didn't really get into it until early 2010. I've always enjoyed writing and poetry is particularly challenging. It forces you to distill thoughts into short concise bits. You have to convey vivid pictures and emotions in a flowing metrical pattern. Even if you are writing free-verse you have to be concerned with how it sounds. Poetry isn't simply meant to be read, it is meant to be spoken, felt and even performed. The jingle Poetry Community gives you a platform from which you can get your poetry exposed and noticed. Also, it allows you to discover other aspiring poets and writers. The connections allow you to develop your craft and increase your knowledge. The community gives you a chance to be inspired and to inspire others. Jingle unites us and allows us to discover ideas, words, and, most importantly, people. The name of my blog is very central to the theme of most of my writing and my life. "Bright Light - Dark Words" works on many levels: In one sense the words are literally 'dark', black liquid crystal lighted by the 'bright light' of the back light of the screen (at least when I write them). In another sense, my words are often dark in theme and context lighted only by the "bright light" of hope and the knowledge that things will get better if people make the effort to change. In a spiritual sense, the "dark words" that come out of me are only possible and only make sense beneath the "bright light" of the one who gives all things meaning. All written words are dark and meaningless unless there is light to see them by. As far as advice goes, be critical with yourself. No matter how many people are saying good things about your writing be tough on yourself and judge it with a critical eye. No matter how many kind and well meaning people tell you that your poetry is "lovely" or "they know what you mean" be harsh with yourself. This is the only way to improve. In fact I wish Jingle had a "Critical Eye" or "Poetry Under Pressure" section once a month or so where everyone could submit a poem and comments had to be critical, instructive or examining. I love someone writing "nice poem" in my comments section but it certainly doesn't make me a better poet and it really doesn't say anything about my poetry. People tend to comment on their feelings about the poem rather than the actual content of the poem. Saying, "I enjoyed your poem" is nice but saying something like: "I enjoyed your poem because your use of trope 'x' and metaphor 'y' really emphasized your theme" is nice, helpful and instructive. The first comment tells me about the person who read the poem and the second comment tells me about the strong parts of my poem and why they work. When you comment are you commenting for yourself or for the person who wrote the poem? I started blogging back at the end of 2005 when I was working on the road a lot more than I do now, more as a cheaper method of rambling to a couple of friends rather than phone calls. Initially I did not consider it as a forum of creativity that folks who didn’t know me would have any interest in but I guess the idea of looking at the carnage of an accident has a broad appeal. With most literary forms there comes the natural instinct to genre-ize the writer into a narrow block. For the majority of the stuff I do there are certain people who read it for that genre, be it erotica, the horror, humour, an article on a perceived social inadequacy or the cartoonish elements. Poetry, on the other hand, for me, does not have these limits – I can be perverse, borderline comedic (often falling flat on that! ), social, political, I just let my mind do what it wants and how it comes out is how it comes out. I find poetry is a personal, though selfish, delivery of creativity where the only person I feel obligated to satisfy is me. In the real world I fear that I am quite stereotyped – the nice but over-sexed good ol’ boy –even our general manager who relies on me in the shop thinks that on my days off if I’m not nekkid I’m thinking about having the opportunity to be nekkid as soon as possible – when I write poetry though it is a safe voice for me as I don’t get the sense that there are any expectations placed upon me. The Jingle community allows me to gain insight into how others create in environments different and/or similar to my own. I’m small town so there’s a heap of perspectives, experiences, emotions and situations that I’ve never been exposed to. Creativity is borne from the society in which one dwells; the psychological impact of one’s society impacts on how a person channels their creativity. In essence, it allows me to expand myself because I get exposed to concepts, structures and presentations that are utterly foreign to my own experiences. Mutter Fluka, other than sounding much like an iconic slur used in describing me in many situations (though if one were to factor in my age and the latest teen pregnancy figures I could away with putting “grand” in front as well) does have some meaning. FLUKA (Fluktuierende KAskade) is a software simulation meant to calculate mathematical probability and theoretical derivations of particles with an indeterminist algorithm, or in other words, a mathematical “yeah but if” based on a scientific formula to factor in chaos. Mutter is speaking in such a way that those around you cannot with 100% certainty identify the content, tone or context of those words. Put the two together and you have the concept that anything can make sense as long as you mutter it low enough that people, not being able to make out most of the syllables, will fill in the blanks based on their assumptions to reach the conclusion that I have to be making sense when the reality is that I’m the guy pantless on the corner arguing with a street light over who’s going to get out of the way. Writing poetry is like being a surrogate mother; you may gestate it but once it comes out into the world, you are no longer responsible for it; it may represent a part of you but you have no control on what it may do to others. What you may wish it to signify isn’t necessarily be how others interpret it based on their own experiences and thoughts. Be gracious, even if you think a comment is a negative to your ‘baby’ – in my experience the negative isn’t meant to be an attack on your creativity but to help expand the skills that may be yet untapped. When have you started linking to Jingle Poetry Community? Why? What’s the reason you name your blog? I named my blog "What About God?" because I feel that we don't give Him the credit He is due anymore. Society is cutting Him out and it makes me sad. I had a near-death experience and know the reality of His existence, I just wish others did too. 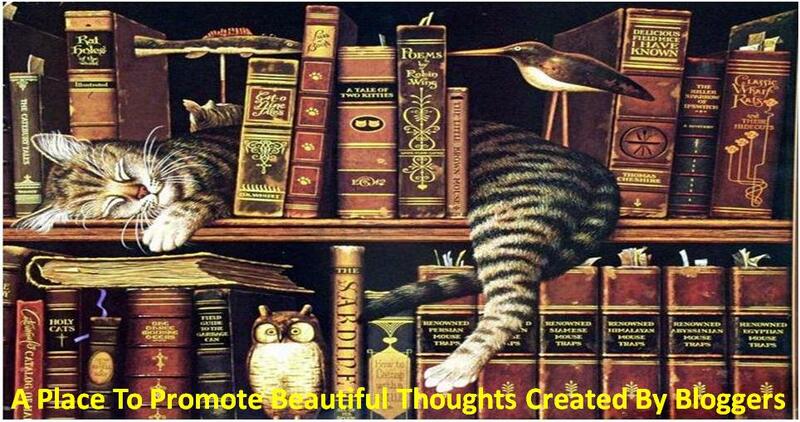 I write a daily thoughts category, share e-mails that I have received, do some commentary, etc. What are the inspirations of your creativity/writing? I see a picture or quote that strikes me and God gives me the inspiration to write something about it and the words usually just flow into my mind to get me started. What your plans/agendas for your future writing? Eventually, I would like to publish some of my poetry and write a book about my life experiences, my struggles with addictions, my MS, escaping from abuse, etc. I started writing when I was about eight years old, but for the longest time I thought myself unworthy, uninteresting or simply unimportant... Then in April/June I just started writing poems (getting my thoughts out there or my head would explode), and surfing along I found Jingle... I know that sounds stupid, but something just felt so right... I don't know how I can explain it? I've been wanting to, somehow, get my thoughts out there and Jingle just seemed like the right place! opinion...) but I would publish at least two pieces per day (the 'On this day' piece plus one more) and no one would ever restrict me! Most of 'me' has been poetry, and I am pleasantly surprised to see so many people actually reading... I'm still not quite sure why? I am so honored by this I could just keep writing, telling you every single thing that has ever inspired me, but... I know we have limited space and not everything might seem as important or exciting to you as it does to me. I began blogging in July of 2006. Poetry is my song and my prayer. I really enjoy the poets who share their knowledge of poetry and indicate to others the type of poetry they're writing and how to write it. This is such a gracious act! Yet, the thing I like the most is reading the new poets' work. It absolutely humbles me. I realize just how many beautifully talented individuals are out there in the world with a deep abiding love for the arts. This really lifts me up to Cloud Nine -- (especially after I've visited book stores and libraries with such small poetry sections). I'm the odd man out on that one! I keep my pen name on my blog so people can find me on my search engine. #1. Each person is entitled to their own style of writing, and it's very important to never be ashamed to show the world who you are. Never let anyone change you. #2 I've a deep appreciation for the English language, and I feel if you reside where English is spoken, you should embrace it by utilizing it properly. Your computer has writing programs with which to help you. If you wish to be a serious writer and should you aspire to publish your work, you will edit, edit, and edit again. I suggest you get into the habit of doing things properly the first time. Use spell check and learn how to use quotations and ellipses, etc. correctly! When in doubt, Google! Once upon a time, a group of scribbling friends and I decided to form a community blog where each of us could write whatever we wanted and give each other feedback and support. The blog went up and running in April of this year. My friend and poet-in-arms Blitzken and I posted mostly poetry, and soon another former member, CC Champagne, began posting poetry. Eventually Jingle Poetry found us and encouraged us to join Thursday Poets Rally and Poetry Potluck. I first posted there in May or June of this year. I've been doing it for such a short time I'm amazed at how incredible the experience has been and how many outstanding poets there are here. What’s the reason you choose the name of your blog? The original name of the blog was Project Mayhem, which was the name of an earlier abandoned community blog that I started with two other writers. We soon figured out that the Project Mayhem name had to be changed because there are simply too many things on the internet called Project Mayhem. We debated several names over a period of a week or so. None of us is truly a misanthrope but we're all misfits and we wanted a self-deprecating name, something like "The Drunken Scholar" (That one is taken, by the way). Eventually we settled on Random Misanthrope. Not recently. A few years ago I worked as an online journalist of sorts, writing articles for a gaming website. However, the website shut down so that adventure came to and end. I've always been told that I'm a good writer and that I should write novels and short stories but what while I have writing skill, I lack imagination. Lots of different things inspire me but mostly it's my fellow poets in our writing circle. One of us will write a poem about a certain topic and it inspires the rest of us to write our own poems on the same topic. We've done that with topics as varied as body hair and addiction. For the time being just to keep on writing, practicing, and honing my skills, and keep on sharing and reading the poetry of the gifted poets on this site. Maybe someday I'll publish my poetry. Growing up and even into adulthood, I was never really exposed to any form of poetry. I was first introduced to Jingle Poetry Community by a good friend of mine who's been blogging for years. She told me it would be a great place to share my poetry and also learn from others. I was hesitant at first, because I'd only ever let a few close friends &amp;amp;amp;amp; family read my poetry before. I can't remember exactly when I joined, but I think it was in either Wk26 or 27 and I've been with you ever since. I love to write at the quiet times when everyone is asleep and I am less likely to be distracted. There's something serene and magical about dawn, so that's where the name "Thoughts Of Beauty In The Stillness Of Dawn" came from. I only write poetry, but I did try writing a piece of flash fiction for Romantic Friday Writers a few weeks ago. I would have to say my mom first. She always used to say poetic things to me when I was younger like "May God protect you always and guide your footsteps in pleasant places" and then when I came to the US, she used to write letters of poetry to me. Second would have to be old Indian music, especially the old romantic movie songs and the classic singers like Mukesh (my ultimate favorite singer), Kishore Kumar, Mohd Rafi &amp;amp;amp;amp; Lata Mangeshkar. I write for the sheer joy of writing and not for any fame or fortune. However, I would ideally love to see some of my poetry in print one day to leave as a legacy and to share with family, friends and new readers. If there's anything else you'd like me to add, please let me know. I started adding poems to the group at the end of April. One of my poems was read by Jingle and I was invited. My nickname has been Swan since I was 17. When I was in a band once the Bass player started calling me the Black Swan. He said he called me that because I could always see the darker side of things. At the time it kind of bugged him I think because he was so optimistic. Thing was I was not down about things, I just always saw that side. I guess I still do. I never forgot that he called me that because honestly I thought it was funny. I write lyrics and really that is how it started. As a kid all I really wanted to do was be in a band. I did not have the patience to learn to play anything so I taught myself how to sing. Well singing for a metal band anyway. I knew I only wanted to play originals and singers usually do the lyrics so it began. Over the years I wrote a poem here and there. And after a while my songs became more poem then song anyway. I started telling people the only difference a lot of times was a designated chorus. Now I am completely focused on my poetry and I think it is getting better because of it. At least I hope so. I almost always write while listening to music. It does not inspire the words but I like the vibe. Like most writers I am inspired by life and the way I look at it. The way I write 90% of the time works like this. I sit down to write. I turn on some music and I start feeling it. Then I just write the first thing that pops into my mind, one line or two out of nowhere really. Then those dictate what the next couple of lines are and so on and so on until I think it is done. Basically most of the time I feel like I am along for the ride and it writes itself. It is usually a fairly fast process. As far as the actual writing I think I need to stretch myself. I may have become too dependent on my style and it may have become too comfortable. I don’t want to stop writing material like this but mix it up more. As far as getting it out there I want to continue to build an audience. I am still young to this and want to work hard to build my internet presence. I am getting some of my poems published in October. In an art and writing collaboration called Inspiration Speaks. It is being put out by Winter Goose Publishing and the not for profit organization ArtPlatform.org. My ultimate goal is to have a publisher release a collection of mine. I would feel a great sense of accomplishment if this were to happen. Overall I feel more motivated now than ever. When did you start linking to Jingle Poetry Community? Why? Summer 2010 I joined because I was invited, and because the idea of finding other poets was intriguing. What is the reason you chose the name of your blog? My blog and webpage has my own name. I started a blog at the request of my publisher who felt it was important for name recognition. The inspirations are the people around me, events from my experience, and things I observe in my students. (I am also a high school English teacher). I often create poetry on my commute to or from work. Book two of Grace Awakening will be e-released the end of August. A compilation of both books will be released in paper later in the autumn. I have a high interest, low vocabulary novel that should be completed by the end of the year. I am in the research stage on a historical novel series. I hope to have it outlined by the end of the year. I am also applying for the highly competitive Masters in Fine Arts in Creative Writing at University of British Columbia. I am also hoping to offer a limited release of art - poetry chapbooks in the near future. Not long after I joined wordpress.com Jingle invited me to participate in Poet's Rally. I stuck around because it was so much fun and because of all the awesome poetry. Mindlovemisery is the name of an older poem but it also represents the three topics I write about the most: Mind, Love, and Misery. Furthermore I really enjoy darker themed poetry. Yes, I participate in a collaborative story-telling group and occasionally write my own short stories. Though it's exceedingly rare I have written some lyrics and the occasional article. Music, other writers (Jim Carrol, Sylvia Plath, Arthur Rimbaud, Charles Baudelaire etc. ), life. My poetry is very much rooted in how I feel and even when the stories are changed the sentiments often reflect my own. I find writing very cathartic and really rather than keep a journal I tend to write a poem when I am working through something. I hope to continue writing daily. I want to teach myself how not to give up and how to push through even when things are challenging. I hope that someday I will be able to publish a book of poetry. I started linking to jingle this spring because I am fairly new to the blogging community. I have been writing poetry since creative writing class in high school and havent stopped since. I was involved in helping run an online creative writing webzine in college, the WritOracle, which has since disbanded. After that I decided to start a blog to share my work, after finding One Stop Poetry over this past year. This eventually led to finding the fine folks of Jingle Poetry Community, which I am happy to say that I have been able to join in. Well when it came to naming my blog (Forced Hot Water), I choose to use one of my earlier poem titles that I had written. Forced Hot Water has always been a favorite title of mine, and I thought it worked on many levels. I am a believer in what my gut tells me as well and if something feels right, deep down in your soul, then more often than not it is a good thing. I think title of blogs as well as poems have a huge impact, and should be treated as equally as any other line or word of the poem, as well as ones blog. Not really. I was an English major at the University of New Hampshire from 2002-2006. So I have had a LOT of exposure to different writing forms, the 20 page essay being the most prominent form, one I do not plan on writing many more of. For some reason poetry stuck out for me. I believe it might have to do with my love of music and the lyrical qualities poems can have. There is the element of complete freedom of form and artistic license that I believe comes with the art form of poetry. In general I love the versatility of the language, and for me that is most easily expressed through poetry. Primarily other writers, classic and contemporary inspire me. I have learned a lot from Walt Whitman, Thoureau, Emerson, Lawrence Ferlinghetti, Langston Hughes, Ezra Pound, TS Eliot, EE Cummings, Albert Goldbarth. The contemporary poetry of Billy Collins has influence my style greatly as well. At the University of NH I had the pleasure of taking many critical and creative writing poetry classes with Charles Simic whose style, much like Billy Collins, I have been able to identify with and draw inspiration from. I find Slam poetry to be inspiring as well. While I dont believe I am a slam poet at heart, I like to draw from the style and try to incorporate some of its aspects into my writing. For the most part, just keep writing, keep experimenting and see where its takes me. I would love to continue to find new ways of sharing my work, whether that be blogging, performing or publishing. I believe that for me poetry has a bit of a mind of its own and I like not know what will come next from my mind, or where it will choose to go. The bottom line for me is to keep pushing the pen across the page, and the limits of my mind. Thanks so much again to all who have read and enjoyed my poetry, and continue to experience others as well through Jingle Poetry Community. I look forward to experience more and more great creativity from everyone. I'm a passionate 28-year-old who loves to write... craves music and has a camera in her hand everywhere I go:) I have three beautiful girls and I love being a mom. I love Jesus and could not do this journey of life without Him. I sing-sing-sing and someday would love to do more with it... but 'till then I write and sing in the shower, sing lullabies to my kids... and for sure rock it out in the car:) I'm pretty compassionate and have a heart for the brokenhearted. I started a blog after starting therapy about a 16 months ago. It's been one of the best things I have ever done. Having an outlet to write moments that have never even been spoken was a release. For me to know that I am not alone was huge for me. Hearing that my work has touched others... it made me feel like I had a purpose. I began to realizing that God has a plan for me and it telling my story... my honest story. I write the lows, highs and the in between's. I write the awful and the beautiful. This blog is me, raw. I love reading the many talented peoples' art as their heart pours out into words. We often use the same words, write about similar topics and some even have similar blog layouts. Yet, we all get to see how unique God created us and how not one person is the same but beautiful in their own way. I also love the camaraderie that is created and support and kindness that is shown. It has lifted my spirit up many times... which I am very grateful for! Don't write for others... write for yourself... if people don't like what you write... that's their problem... be you and never change. Be genuine. Believe in someday. You are too valuable to be left untitled . My favorite poem is http://untitledmoments.com/2011/02/21/the-yellow-dress/"&amp;amp;amp;amp;amp;gt;The Yellow Dress. I went to bed and words just kept coming to me. I finally sat up, grabbed my laptop, and wrote from the depths of my soul.... this to me was when I realized that writing poetry was more than a passion but a necessity to heal from all the untitled-moments from a devastating storm.. so here I stand in an aftermath... not in defeat, but in courage. I started about two and a half years ago. I started a blog called 'Common Obscura' on blogger at first but soon switched over to wordpress. I have been blogging at my present blog modern rage since early april. I am not entirely sure why poetry, myself...the words just kind of come to me and rattle around in my head and so I spill them out on paper and let them do their own thing from there. Sometimes none of it makes any sense to me until way later... especially with the longer poems (most of my poems are cycle poems...very long and in several parts/sections). They always seem to fit nicely together with almost no help from me what so ever. the increased audience is a definite plus but also the very nice comments help with the confidence and make it easier to push yourself. reading the work of others is a big benefit...a lot inspiration...a lot of stuff I would not get exposed to otherwise. just came to me...I liked the sound of it. don't get caught up in the numbers. It is not quantity of readers but quality of reads.